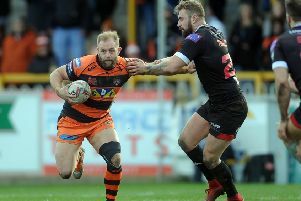 Castleford Tigers boss Daryl Powell admitted to frustrations at his side not being able to produce an 80-minute performance at times this season, but is backing the players to get it right. The Tigers have three times led by big margins at half-time in Betfred Super League matches only to be left hanging on somewhat after the break, but have still managed to get over the line to claim winning points in each of the these contests. Head coach Powell points to Castleford’s record so far of six wins from eight games to show they must be doing something right, although a complete performance has not been delivered yet. He told the Express: “In the games when we haven’t kicked on in the second half it’s generally been when we look like we’ve got the game won at half-time. “We’ve been 20-0 up against Salford, 24-10 up against Leeds and then obviously well up, 28-6 at Huddersfield. “It’s obviously a little bit of a mental issue that we are allowing teams to come back in, but we are winning games aren’t we? Powell added: “We’ve been consistently playing well in the first half. “We were really controlled (against Huddersfield), our kicking game was excellent - we scored tries from kicks - we put them under pressure and we picked when to go to the edge really well. “It was just a controlled, composed performance, which we’d spoken about. “They obviously had a kick up the backside and came out in the second half and really challenged us. “We didn’t handle it as well as we wanted to so there’s some things we want to improve. “The key now is put two halves together. It’ll come. “The boys are working hard to get themselves where they need to be as a team with everybody playing well within it.